Myers Park United Methodist Church is considered to be one of the architectural gems of Charlotte, North Carolina. Proudly postioned at the corner of Providence and Queens, the lovely Gothic Revival style sanctuary has been a fixture of the Myers Park neighborhood since 1929. 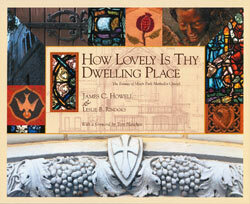 Dr. James Howell has written a collection of moving meditations, inspired by the beauty of the architecture and structured around the familiar Methodist Order of Worship. Mingled amongst these are bits of history and accounts of how and why the achitectural elements came to be. The book is filled with stunning photography, some full page plates, others up close details of stained glass windows and chancel carvings. Exquisitely detailed elevations and plans from architect Louis Asbury’s archives are also included.